MinerEU, an official Gridseed and ZeusMiner distributor, has announced today a new summer sale of Scrypt ASIC miners and the promotional prices they now have for some of the miners are really attractive. 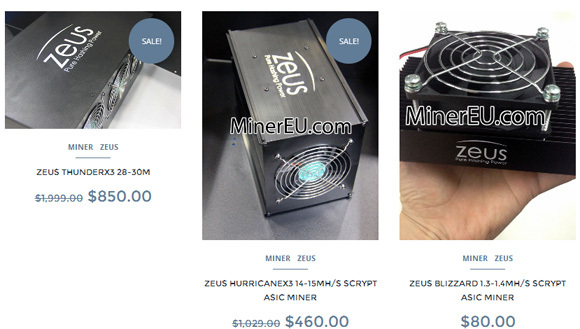 In fact these new prices make it really much more attractive to order from MinerEU than to purchase directly from ZeusMiner, especially the larger Hurricane and Thunder miners that you can currently get at half their normal price. 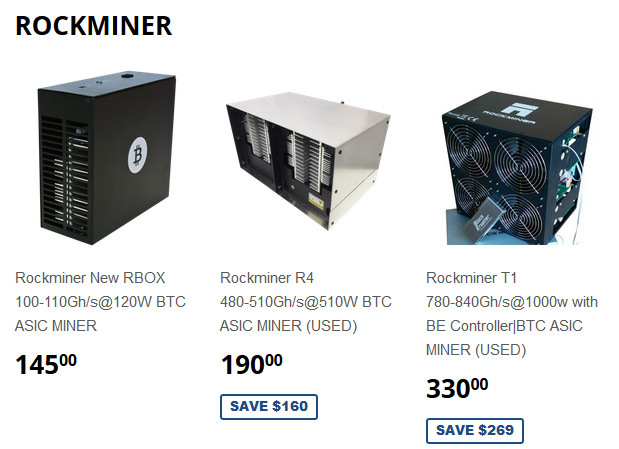 So if you were considering to buy some Scrypt ASIC miners and not do some pre-order, then you might want to check this promotion. Furthermore if you buy 4 or more ZeusMiner Blizzard miners you can use the promotional code blizz240 in order to get a price of $60 USD per unit instead of the regular single unit price of $80 USD. 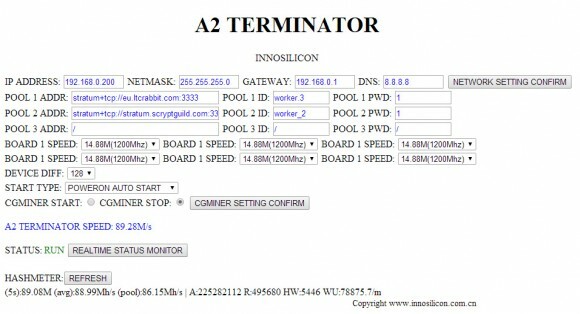 What we would really want to see however is a price promotion for the A2-based Scrypt ASIC miners as well, though apparently Innosilicon is still selling their 28nm Scrypt ASIC chips at pretty high prices and as a result their miners are still much more expensive compared to the competition for the same hashrate. Last month we’ve had the opportunity to do some remote performance tests of one of the earlier prototypes of the A2BOX Scrypt ASIC miners and recently we were able to get our hands on one of these powerful miners to do a hands on review of the final product being shipped to customers from MinerEU. These miners are based on the 28nm Innosilicon A2 Scrypt ASIC chips and have 48 of them placed on 6 separate modules able to provide a total hashrate of about 84-86 MHS. The device comes with a built in power supply and a Raspberry Pi controller with a web based control panel, so it is ready to be connected and you can immediately start mining with it. 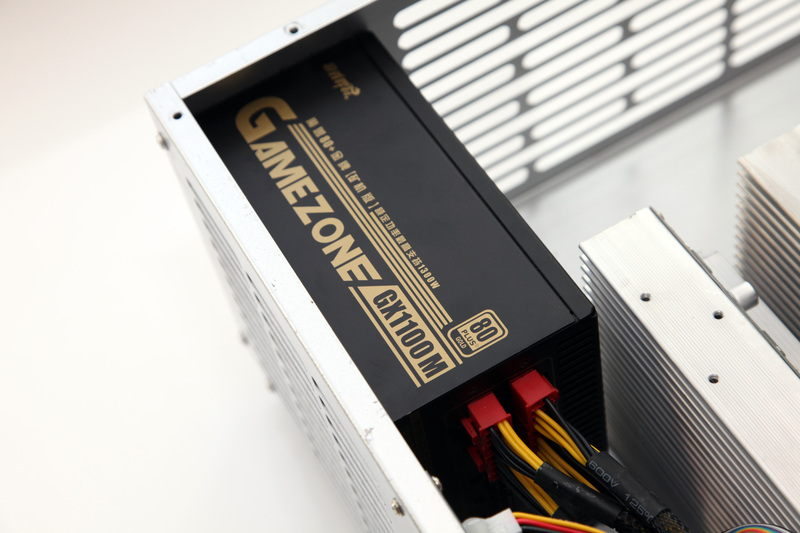 The power consumption mentioned in the specifications of the miner is 750W and the power supply you will find inside the case is GameZone GX1100M, apparently rated at 1100W 80Plus Gold certified. We could not find that much information about these power supplies as they are apparently a Chinese brand, but a good quality one judging from the specs and the performance they offer – supposedly providing 90% efficiency. 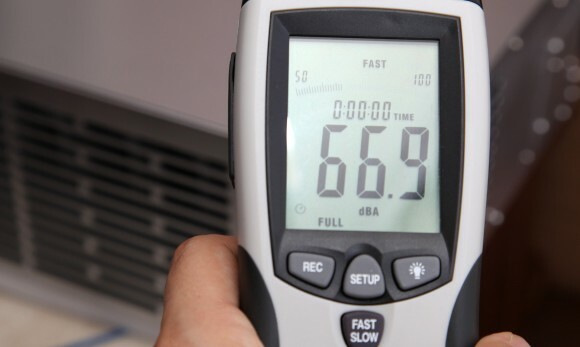 We are going to be comparing these power supplies to other well know brand model in terms of power usage and efficiency, but we are not going to be focusing on that here. The review of the miner will be done with the ATX power supply that you get the Scrypt ASIC miner with and as we’ve already mentioned the GameZone GX1100M does a great job in powering the device. The specific model should be capable of handling peaks of up to 1300W as we understand and it uses a modular design, though not fully modular. You can see that inside the case of the miner there are 6 modules with big aluminum heatsinks. Each module has 8 chips and there are heatsinks both on the back of the PCBs as well as on the front side directly placed on the A2 chips for better cooling. The fact that the device uses 28nm chips and has large heatsinks on both sides along with serious airflow ensures that the miner runs pretty cool, even with the not so low power usage of the device. We’ll get back to the cooling system and its performance and the operating temperatures in a bit when we start talking about the tests. 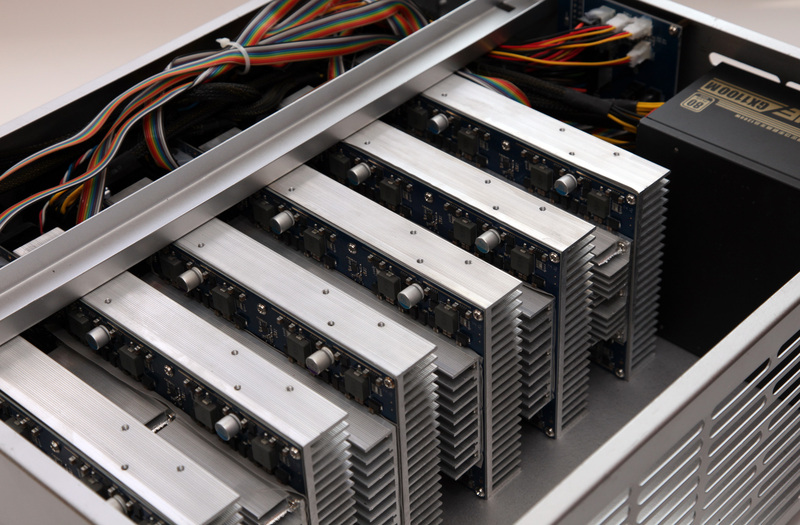 What does make a very good impression is the fact that the miner is very sturdy and well built and you would expect nothing less for a piece of hardware that is so expensive. 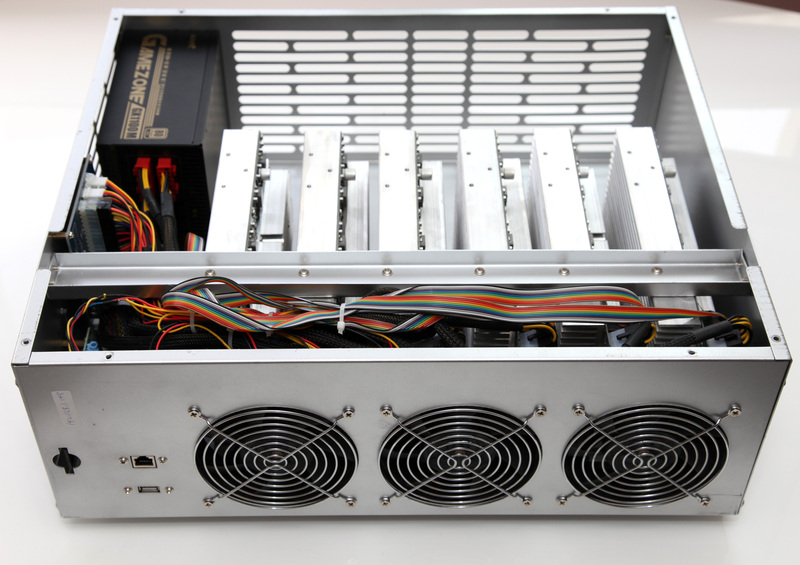 The A2BOX Scrypt ASIC miner comes in a standard 4U case, so you can say that it is ready to go directly into more serious mining farms that use racks in data centers for example. The device itself does look a bit like a server because of the case and because of the noise level you will get from it. We’ve seen noisier miners, but you cannot call a noise level of about 67 dBA at a distance of 1 meter from the device very silent either. The miner uses three server grade 120x38mm Nidec TA4500DC fans for the cooling and they do a great job with the noise not being considered at all. What you should be well aware of is that this miner is not a great choice to have at home in your living room or bedroom to mine 24/7, it is best suited for use in a well ventilated dedicated room for mining hardware or a more serious mining farms. 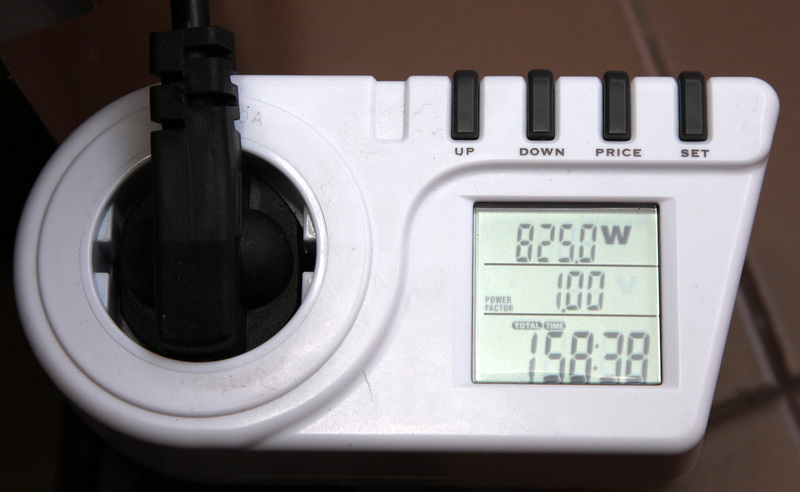 Taking a look at the power usage of the device we can see that it needs about 825W of power from the power socket, and if we take into account the 90% efficiency of the power supply the actual power consumption of the hardware should be about 750W. You are however going to be paying for the 825W of power as the difference is what gets wasted as heat during the conversion inside the PSU. Since currently Innosilicon A2 Scrypt ASIC chips are still the only ones that are based on 28nm process they are also the most power efficient solution available on the market in the form of a Scrypt ASIC miner. The drawback is that the miners based on these chips are more expensive to produce and that affects the end user price as well, but at the moment reaching the same hashrate with alternative solutions that are based on 55nm chips would come with about 3 times higher power consumption. Here are two thermal images we took of the A2BOX miner working and as you can see the operating temperatures of the hardware are pretty low, we were actually surprised after we were used to seeing higher temperatures with the 55nm ASIC miners. The three big cooling fans push air inside the case thorough the large aluminum heatsinks and the hottest temperature we’ve measured was just at about 42 degrees Celsius. This is with an ambient temperature of 25 degrees C, so there could be some variance and you should be careful not to place the miner in hot areas without good ventilation. Now, we’ve mentioned that the A2BOX Scrypt ASIC miner comes with a built-in Raspberry Pi controller and it also has a web-based control panel installed, so you can easily access, control and monitor the device. The main screen offers quick and easy options for you to setup the miner’s network settings, mining pools, operating frequency, basic stats etc. As we’ve said it is more basic solution, but has all of the important stuff in a single page, so it is very easy to use. 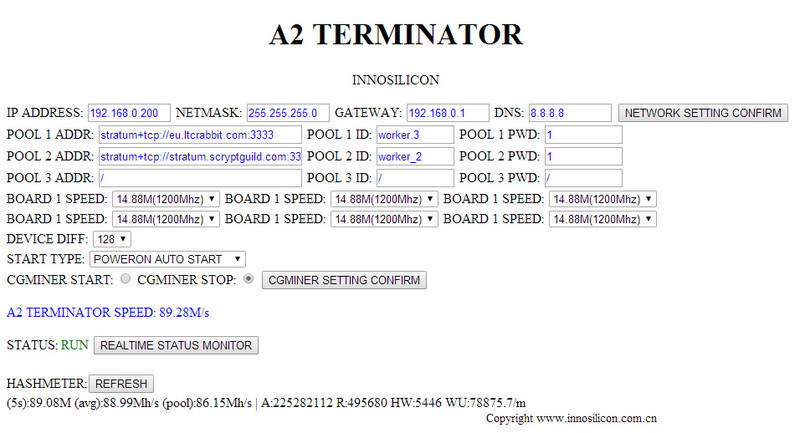 As a backend the miner relies on a special version of cgminer 3.9.0 with support of the A2 scrypt ASIC chips. The web interface does allow you to set the operating frequency for each of the 6 modules independently, though you have only two options available – 14.88 MHS per board at 1200 MHz or 12.40 MHS at 1000 MHz. There is also a more detailed real-time status monitor available that can help you monitor the performance of your device and if needed to take some steps to improve the results you are getting or change some settings for the best possible results. The results you see on the screenshot above are from the miner running at the higher clock of 1200 MHz. With our initial tests of the earlier prototype we’ve seen that it has produced a bit more HW errors that we’ve liked, but now the final production units does seem to perform much better and with far less HW errors. Do note that for ASIC decides it is normal to get some HW errors over time, however you should find the best balance between performance and HW errors in order to maximize the useable hashrate. If you would like to have a bit more advanced and user friendly web-based control of your miner there is a solution available, a Scripta-based image with A2 chip support. You can download and put that image on another SD flash card and replace the one you get by default with the miner installed in the RPi controller. We do recommend to keep the original SD card with the official image intact just in case and as a backup and not to overwrite it with another image. But what about performance, well it is also improved and higher than what we were getting in our earlier remote testing of the prototype device. As you can see on the screenshot above taken from the LTC Rabbit for a period of 48 hours the hashrate remains very stable and averages somewhere in between 85 and 86 MHS poolside. The locally reported hashrate is a bit higher, though the poolside reported rate from the miner’s web interface is also about 86 MHS. Testing the device at other pools hash also shown us an average in between 85 MHS and 86 MHS pool side hashrate with the miner running the A2 chips at the higher 1200 MHz operating frequency. What can we conclude about the 86 MHS A2BOX Innosilicon A2-based Scrypt ASIC miner is that it definitely delivers what you are promised. You get a well designed and built device that comes with absolutely everything that you need to start mining immediately, no need to buy something separately to make it work such as a power supply for example that can add to the expenses that need to be calculated when you consider what is the expected return of the investment. The miner is very power efficient for the hashrate it offers when you compare it to what the alternative 55nm solutions do provide at the moment. The miner is not very silent, but the proper cooling is way more important and the fans do a great job in keeping the ASIC chips cool and operating with low error rate. All seems good so far, but there is a catch and one thing that is not that great and this particular thing is the price of the miner. Currently the standard price of the 86 MHS A2BOX Scrypt ASIC is $10200 USD, so out of the budget for many miners and a more interesting option for more serious miners and larger mining farms. We have some good news for the people that are actually interested in buying this device, we have a special promo code that will get you $700 USD off the standard price, so you will be able to get the A2BOX Scrypt ASIC for $9500 USD. All you have to do is enter the following coupon code when you add the device in the shopping cart 9500A2BOX_cryptomining-blog to be able to take advantage of the promotional price at MinerEU. There is also another alternative option, a smaller and more affordable in terms of price version of the A2BOX miner – the 28 MHS A2Mini Scrypt ASIC available for a price of $3900 USD at the moment. Unfortunately there are still no very affordable solutions that use just one or two A2 chips inside a compact and very power efficient device while still producing a few MHS available that would be of interest to the average small crypto miner that might be interested in getting a very affordable Scrypt ASIC miner.